Each of our individual rooms have luxury king-sized beds, air conditioning, private terraces with high-quality outdoor furniture, a private/separate bathroom, kitchenettes and free WIFI access. Cielo is Spanish for 'sky' and this is what inspired this room. The sky here is amazing! 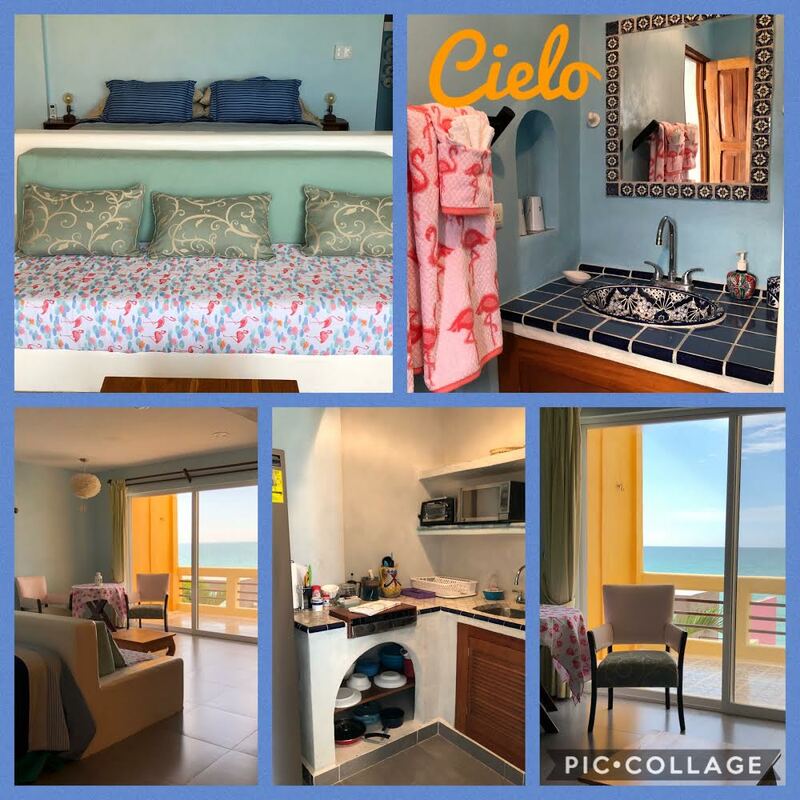 If you are an early bird, you can enjoy the sunrise from your private balcony and watch the pelicans gliding over the sea below. During the summer, you will be able to see flocks of pink flamingos passing just outside your room, sometimes thousands of them! At night, you can see most spectacular sunsets, when a deep red sun dips below the horizon. The Cielo room has a king size bed of very high quality. There is also an additional day bed which can be used as a second bed. A comfortable bathroom adjoins the room, with soft towels and a dispenser for shower gel, shampoo and conditioner. In the kitchenette, you will find a coffeemaker, microwave oven, a two-burner gas stove, refrigerator and a dispenser for purified drinking water. The room is full equipped for what you need to make yourself a full meal, minus the food! Wide sliding doors open to your terrace for a lovely breeze, but there is also an air conditioner and a ceiling fan. There are luxury hammocks both inside the room and out on the terrace. The room has access to free Internet WIFI. Spanish for sand... as the Flamingos Inn is located right on a beautiful coral sand beach. The last thing you will hear before you fall asleep is the sound of the waves gently washing the beach and this sound is also what you will wake up to in the morning. Make yourself a nice cup of coffee in the kitchenette and enjoy it on your terrace before you come down for a delicious breakfast. Our breakfast always includes several local fruits... or have it brought up to your room if you like! The room has a king size bed of very high quality. There is also a day bed which easily can be transformed into an extra bed. In the room is an ensuite bathroom with soft towels and a dispenser with shower gel, shampoo and conditioner. In the kitchenette you will find a coffee maker, microwave oven, a stove with two gas burners, a refrigerator, and a dispenser for drinking water. The beachfront room is also equipped with what you need to make yourself a simple meal. Wide sliding doors to your terrace give you a nice breeze, and there is air conditioning, ceiling fans and luxury hammocks in the room and on the balcony.And of course, access to free wireless internet. 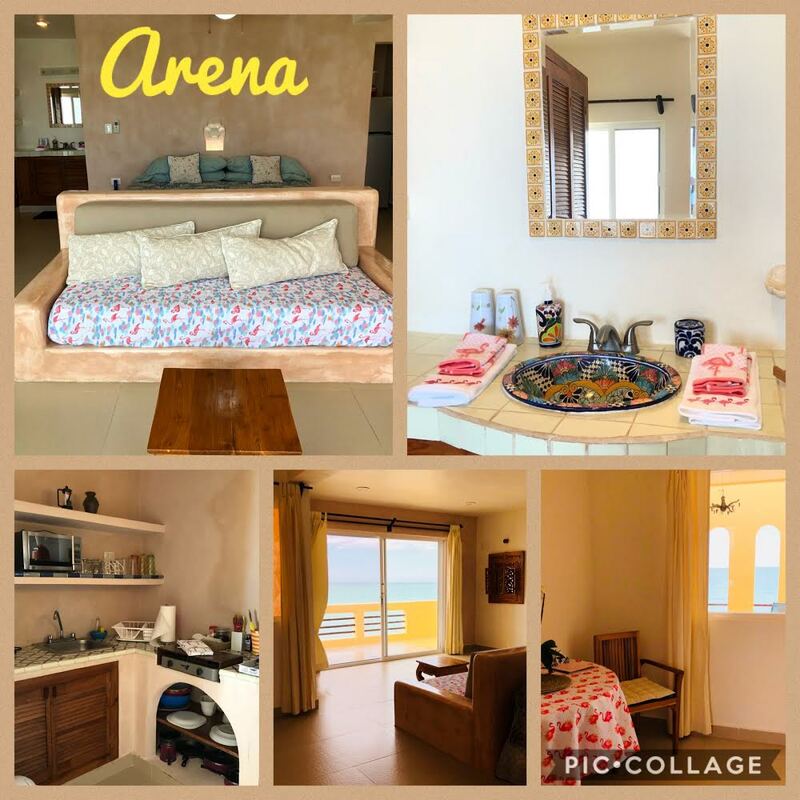 The penthouse is named Mar – Spanish for the sea – and the sea is what you are surrounded with during your stay here on the beach. Who can ever get tired of watching it? It changes color all the time, from deep green to the lightest blue you have ever seen. And there is always something to watch... the local fishermen sliding by, the pelicans diving for fish, huge flocks of pink flamingos and, from time to time, dolphins jumping... just as you put your camera away, of course. The penthouse is the jewel of our B&B. It covers the whole third story with its huge terrace. As you walk in, you enter a living room and a fully-equipped kitchen. There is a seperate bedroom with a very comfortable king-size bed and air conditioning. The living room has two day beds, which also work as extra beds. Since Yucatan is famous for its hammocks, the penthouse also has luxury hammocks that will guarantee a good nap. The bathroom is spacious, and even from the shower you have a sea view through the glass bricks. Just steps from the ensuite bathroom you will find a walk-in closet for your clothes and luggage. The terrace is probably the best terrace you have ever seen... complete with a spectacular view and enough space for several sitting areas and two sun beds. La Casita is our bungalow. La Casita means "little house" in Spanish, and our guests are surprised when they see how roomy La Casita is. Flamingos Inn is located on the beach, so even though La Casita is not beach front, you have access to a huge beach front terrace. From there you can step right into the sand. Go swimming in the sea, take an outdoor shower and join us for a delicious breakfast. Several of our guests prefer La Casita and call it their home away from home. Some guests have remained for as long as three months. Please ask us for a special price if you are interested in a long-term stay. It is located in the garden, close to the pool. Enjoy morning coffee on your terrace as you watch the humming birds drinking their nectar. La Casita has a king size bed of the best quality. It also has A/C, ceiling fan and good wi-fi. It has a kitchenette with what you need to make yourself a simple meal. La Casita has a nice private terrace, and the bathroom is equipped with soft towels and soap, shower gel, shampoo and conditioner. The pool is only steps away. We think you will love it here! El Sol is our ground floor sun room. El Sol means the Sun in Spanish, and the doors of El Sol opens onto a beautiful terrace where you can enjoy the sun all day. Our guests are thrilled when they see how bright and colorful this studio is. 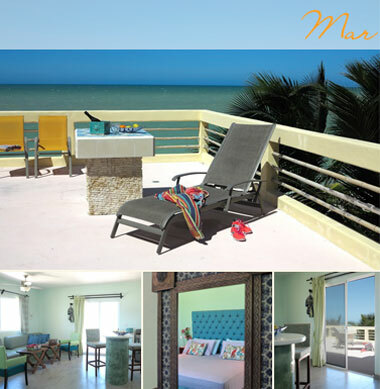 Flamingos Inn is located on the beach, and El Sol is our ground floor, beach front King Studio. Your bedroom opens to a huge beach front terrace. From there you can step right into the sand, go swimming in the ocean, take an outdoor shower and join us for a delicious breakfast. Enjoy morning coffee on your terrace as you watch the pelicans skimming the ocean, or Flamingos flying overhead. El Sol has a king size bed of the highest quality. It also has A/C, ceiling fan and good wi-fi. It also has a kitchenette with what you need to make yourself a simple meal. El Sol has a nice large terrace, and the bathroom is equipped with soft towels and soap, shower gel, shampoo and conditioner. The pool is behind the studio in the garden area. There is no day bed in this studio so it can only accomodate a maximum of 2 persons. Our guests love this studio, we hope you will too!